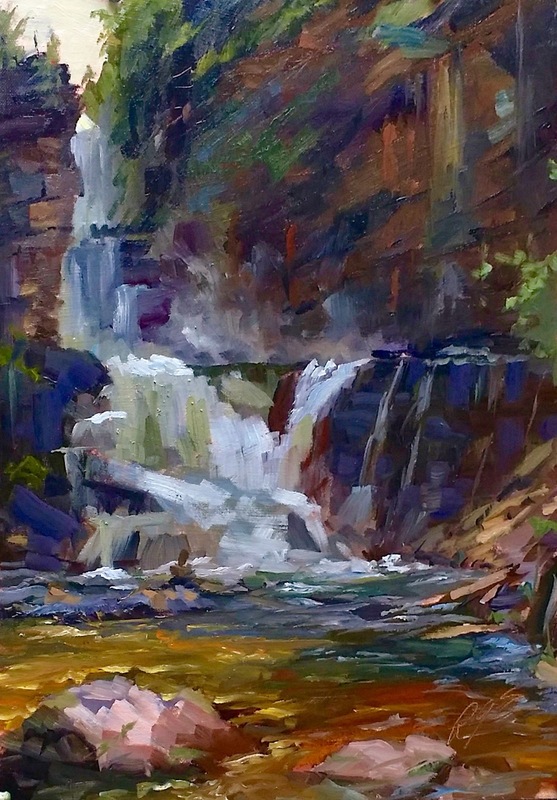 As an unofficial initiation back in college, groups of students would head north of town to a narrow gorge known as Cascade Canyon, to complete the ‘C’ of the “ABC” rite of passage, after jumping off Adrenalin Falls and Baker’s Bridge into the rivers below. This gorge was cut by Cascade Creek, a high mountain snowmelt-fed stream –frozen solid for over nine months a year– and only saw the sunlight for a little over an hour on an average summer day. The thrillseekers had to hike down a steep ravine bringing nothing that couldn’t get wet, and enter the canyon’s gauntlet where there would be no turning back even if one got too scared or too cold. The canyon featured a series of small waterfalls, natural slides, snaking pools through which one swam quickly before full-body numbness from the frigid water, rockclimbing, and the final plunge into the last pool where the canyon opened up and the newly initiated could warm up slightly by hiking fifteen minutes back to the car, sans towel or dry clothes of course. You may recycle either full lines or modify the form to use only a word or phrase from the original lines. You can choose a rhyme scheme or have unrhymed lines, but the motive should be to go for a tiered, cascading effect. They listen to the myna birds dicker in the grass. she must keep adding, thought by thought. She sweeps the petals, smells their russet imprint. and her son outlast her patience by a rose. Already he is tiring, puling at the flowers. flaring like an orchid, or a cockatoo’s unruly crest. the path, rinses the sky of its featureless blue. He is giving that water, now, to everything. •Write a poem and post to your blog. •Enter a link directly to your poem and your name by clicking Mr Linky below. •There you will find links to other participating poets. •Read and comment on their work, and be sure to check back in the following 48 hours for more entries. •Please link back to dVerse from your site/blog and encourage your readers to engage. •Comment and participate in our discussion below, if you like. Well, I’ve had a helluva time with WordPress today, besides all the usual headache anytime I try any resembling a shape poem. I hope it’s working better for everyone else, as I’m itching to read! Does anyone know the best way to format poems in the WordPress editor? For instance, how do I make a space a space? If I try to hit the space bar to indent lines, the editor ignores it so I have to resort to using visible space-savers, tainting the image and effect. Thanks for any technical know-how, and glad you’re here. That was my next question. Read my mind. Thanks again! Oh thank you! If I get time later I’ll go back in and edit out the visually overwhelming slashes. But definitely good to know for next time. Actually, the slashes visually work as cascading waterfall; I liked it; who knew? Thank you for this tip. Spacing can be tricky. Hi Amaya and All. Amaya, I just learned from Sabio that if you hold the shift and control keys down while you hit enter it will only single space. Hoping that helps you. Hello… I tried to write about cascades and rivers in the cascade form. Zion is incredible. Along with all the other canyoneering opportunities in Utah’s Canyonlands. But Cascade was a whole other type of canyon, and definitely not warm water! I heard from my bro who still lives in the area that the adventure has become much more dangerous due to an engineering project diverting another creek into Cascade making for permanently higher water volume, not just during a week or two of runoff. There have been deaths. But of course kids are still going to run it. I used the word cascade, but I want to come back and try a cascade poem, too. Well, maybe the fifty foot jump off the bridge would have been more your cup of tea? It was a beautiful canyon and in the winter, ice would pour over the walls for a favorite ice climbing spot as well. I hope you do come back for round two. Thanks, Merril! Good evening all and thank you, Amaya, for hosting and giving us an amazing prompt. I haven’t been to many waterfalls or cascades but hope to visit some smaller ones in England. Here in Norfolk we don’t have anything like them as our landscape is totally flat but we do have the sea. I won’t be around long this evening as I’m suffering with asthma at the moment – I lost my voice and could hardly breathe over the weekend – and am not sleeping well, so I’m aiming for an early night. I’ll be back in the morning to read and comment. I hope you feel better tomorrow, Kim. I’m kind of in the same boat. Ruptured my ear drum from a coughing spell last night at 2am. It’s been ringing all day. Good thing this is an online pub or I wouldn’t be able to hear a thing! Take care. The artist paints some beautiful oils. I’m glad you took the trip, Dwight! Hi Amaya, thank you hosting this lovely prompt. In Alberta, we actually have Cascade Mountain and Cascade Falls – so this made me recall my summer adventures climbing a mountain during that time. Grace, I tried to leave you a comment about your poem, but WP seems to be having more technical difficulties all of the time. I loved your photo and the way you described being on the mountain. Thank you Amaya for hosting today. Really like this prompt. I have shared a secret cascade. Glad you made it, Rob! Like Rob, I tried to stick to your “form”for the 4 tercets, then struck out free ,for the finish, capping with a haiku. Thanks for hosting; I enjoyed this challenge. Great, Glenn! Yeah, I took liberties with it as well. I usually like to break the rules a bit. Especially with the repetitive forms. I am not a quick responder when it comes to writing but I will definitely read what others share. Thanks for this interesting prompt. I love this blog! It’s a wonderfully interesting and welcoming site. Speaking of WP issues, several of those I follow are all of sudden “unfollowed”! Another brick in the wall!? My Image-Verse.com website will be down for a couple hours. I do self-hosting, so I am doing some restoration and reinstall. Hello Amaya- Joining in today!